We can say that in recent years, production methods and industrial production have greatly varied and therefore the requirements of customers in terms of both treatments handling and logistics of the parts. This effect has caused a tremendous diversity of plant to the point that customers often find themselves to buy on paper a machine that does not exists at least at the time of acquisition. 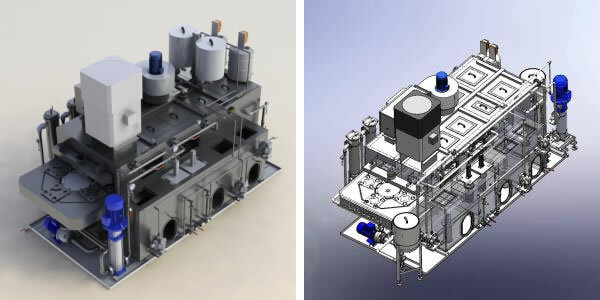 This consideration led Ceever to invest in an innovative 3D design Cad system [Solid Work 2010] that is based on a design method for solid modeling. The benefits of this new technology are considerable. On the customer side the greatest benefit is to be able to see the solid model of the plant [designed 100%] prior to implementation. The 3d vision greatly facilitates the understanding of the machine and allow to make changes on customer suggestion if necessary.